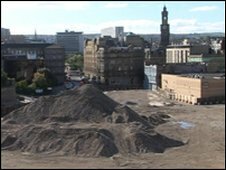 A regeneration project which was said to revolutionise Bradford city centre is still not completed - five years after demolition work began. The multi-million pound Broadway retail and leisure complex had been hailed to be a vibrant shopping destination which would bring up to 3,000 new jobs. But developers Westfield have called a halt to the project until next year because of the recession. Bradford Civic Society said the stagnation was harming the city centre. Chairman of the society Anthony Mann said: "There's only a finite amount of business in Bradford and it will eventually move to Broadway. "Unless we do something else to get other people in, and do it soon, you can paint a very bleak picture for the city." Bulldozers moved into Forster Square to begin work on the project five years ago. But now all that remains in site is a vast empty space with piles of rubble from the buildings which had been cleared to make way for the new development. In a statement Westfield said: "Given the serious dislocations going on at present in global financial markets we will not be commencing construction on any major projects, including Bradford, during 2009. "However, we continue to work on pre-development, pre-letting and project planning so that we are in a position to recommence when the environment stabilises." How the recession is hitting Yorkshire and the Humber region.